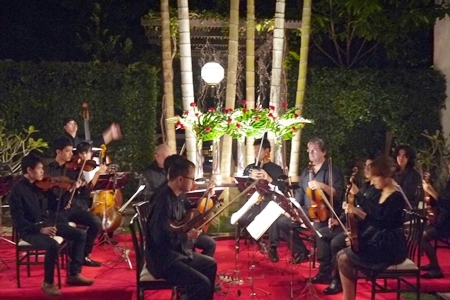 The Silpakorn University String Orchestra led by Tasana Nagavajara performed in the Rachamankha Hotel and then at the Chiang Mai University Art Center on December 8 and 9, 2012. On Sunday afternoon, December 9th, the splendidly refreshing string orchestra from Silpakorn Univeristy led by intrepid musical itinerant violinist Tasana Nagavajara delighted a capacity audience in the downstairs gallery of the Arts building at Chiang Mai University. This group of around 20 players is composed of richly talented young musicians supplemented by the more experienced talents of Leo Phillips on viola, Kittikhun Sodprasert on cello and of course led by Tasana himself. Organizer Donjai Srivichainanda of M & M Productions joins Tasana before the show. Tasana often brings this wonderful ensemble on tour and this was their second visit within two years, having performed at the Rachamankha Hotel the previous night and in Chiang Rai on two occasions before that. Tasana loves Chiang Mai and his good humor, excellent mastery of the violin and inspired command of the small orchestra all made for another perfect event. How lucky we are to have the opportunity to hear this standard of performance by these young musicians with such flair on our own doorstep. The afternoon concert opened with an exhilarating performance of one of the Concerto Grosso by Baroque composer Corelli, featuring solo playing by Tasana, Kittikhun and the young violinist Athiya Voravijitrapun – all of whom displayed exceptional talent. The orchestral backing was wonderful – precise, vibrant, forceful and energetic, making this rendition quite extraordinary. This piece was followed by one of Joseph Haydn’s violin concertos with Tasana as soloist. He is such a very astonishing and surprising musician – his playing was immaculate as it always is, but in the adagio second movement, Tasana’s interpretation of the gorgeous lyrical opening melody was quite ecstatic as he captured its eloquence and beauty, richly enhancing it with great control and giving us a version of which Haydn himself would have been proud. 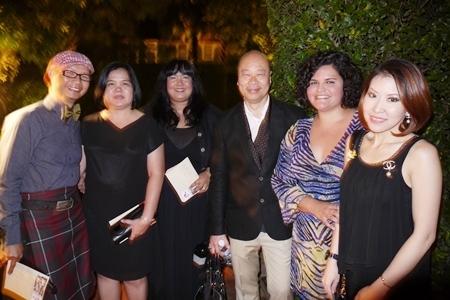 Organizers Marisa Marchitelli (2nd right) and Donjai Srivichainanda join the owner of Rachamankha Hotel Rooj Changtrakul (3rd right) and guests for the evening performance. The second half was a mixture of shorter but nonetheless memorable pieces, opening with the ever popular Canon of Pachelbel, potential and recently actual film music at its best and written 200 years or so before celluloid was invented! The orchestra showed great control and sensitivity as the music built from the somber opening notes on lower strings to the full orchestral passion of this haunting masterpiece. For me the highlight of the second half was the magical transcription of Jarun Manopet’s ‘Lawng Mae Ping’, surely Chiang Mai’s own special anthem. 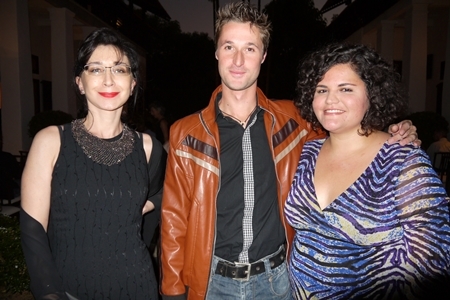 Jade Conrad and Jonas Dept chat with Marisa Marchitelli before the performance that wowed the crowd. This evocative, tuneful and now historic work of genius captures all the beauty of our region in less than five minutes – no mean achievement! 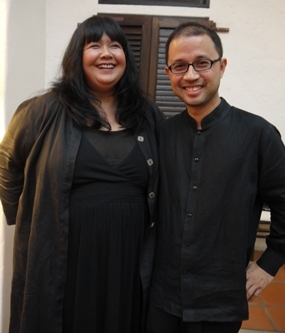 However, the audience was in for a delightful surprise when an Isaan melody, arranged by double-bass player Sudarat Taengtang, captivated everyone – the piece was the prize-winning entry of an internal University competition and showed just how much latent and actual talent these young musicians possess – their tenacity and determination is quite remarkable. Among other great favorites included and which drew deservedly thunderous applause from the audience were Schubert’s Ave Maria, Strauss’s Pizzicato Polka and pieces by Leroy Anderson. There was an encore – Santa Lucia, the beautiful Neopolitan Folk Song which has now become the anthem of Silpakorn University, in deference to its Italian founder. The orchestra deserves all the praise it can get as does the more mature musicianship and leadership of the likes of Tasana, Leo and Kittikhun. We all wish you well in the New Year and look forward to a swift return to Chiang Mai where you have a firm place in our hearts. 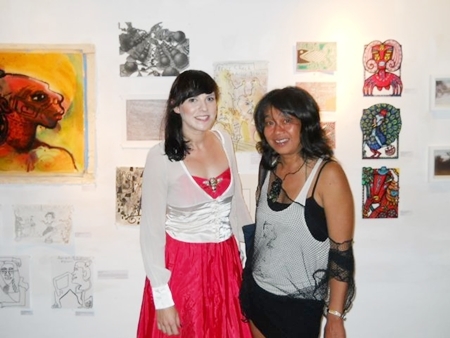 One of the artists with works on display at Sangdee Gallery for Circus Terminal. TA collaborative effort of the Uncooked Culture, Circus Terminal featured the works of Kobina Wright (USA), Erin Lee Benson (USA) and Chutima ‘Nok’ Kerdpitak (UK/ Thailand) who talk about their work, experiences and adventures. In addition to art pieces on display there were dance performances by S.I.N.E. Crew from Hanoi, music by Space 360, Shoegarden, Muninn, and performances by Boonsong Roothab and Gathering Goodwin. The Circus Terminal was held at Sangdee Gallery on Saturday, December 1 and further performances were held at 3 Kings Monument. Organizers Chutima Kerdpitak and Katie Jade Hawker of Surface Arts. Guido ‘Guyido’ Goedheer, a Dutch artist faithful to the CoBrA movement initiated by a group of renowned European artists in the late 1940s in Paris. True to the CoBrA method, Guyido’s latest collection, ‘Life’, incorporates art styles that range from primitive works, to children’s art, to the art created by the mentally ill. In ‘Life’, he portrays the coexistence of human beings and animals through unique compositions that use a combination of strong, vivid colors. These colors are used to dramatically express a high degree of intensity, but the moods portrayed in each painting are diverse. Art critics have characterized Guyido’s expressionism masterpieces as child-like, yet powerful. 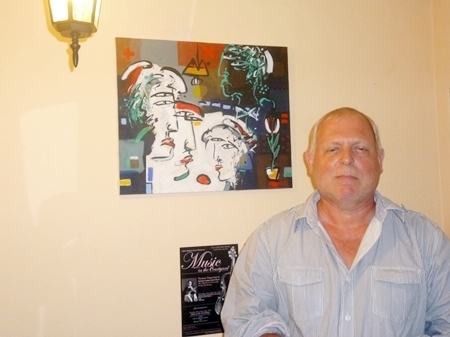 His works are on display at Anchan Vegetarian Restaurant on Soi Hillside 2 on Nimmanhaemin Road. 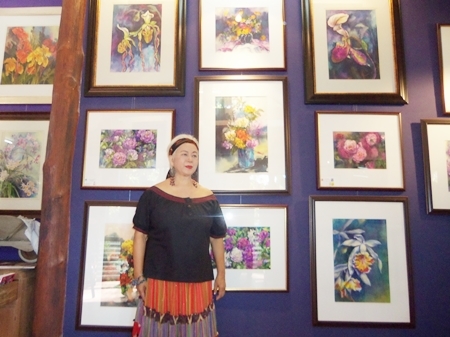 National artist Ern-Orn showcased her flower paintings at a garden party. A Sunday garden party at the beautiful home of local and national Thai artist Eng-Orn Homsuwan at the Wang Tarn Resort in Doi Saket on December 9, 2012. This was a really special occasion. Eng-Orn has lived in her home with spacious grounds for just over 3 years and she decided to build a gallery, which houses the Flowers in Bloom exhibition, in the grounds and with Sunday being its official opening with a celebratory ‘at home’. The gallery itself is small and compact and houses over 50 paintings, all of them devoted to flowers in bloom. Wonderfully colorful pictures of various flowers – roses, orchids, hydrangeas and many others - adorn the walls of this tasteful and enticing display. Flowers have always been a speciality of Eng-Orn and the splendid array of colours – shades of purple, yellow, orange, pink, red and blue - give the visitor an instant and memorable vision of the beauty of nature in all its majesty. Eng-Orn captures all of this and more in her remarkable exhibition. Complementing this exhibition was the garden party – set on undulating ground with shade from tall trees, the several dozens of guests were able to amble around and sit in many of the shaded areas at tables, helping themselves to a wide variety of barbequed foods and fresh fruit all washed down with glasses of wine. The atmosphere was serene – bright sunlight filtering through the trees, groups of people chatting happily over their lunch, the smells of barbequed food wafting through the bushes and all this supplemented by the gentle music from the well-known group Pink Panther, whose renditions of songs of a by-gone era made a perfect backcloth to a fabulous event – in fact as the famous singer Lou Reed once wrote “It’s such a perfect day, I’m glad I spent it with you…”; and all of us who were there at Eng-Orn’s delightful event were so glad to have shared that perfect day with her and her husband. 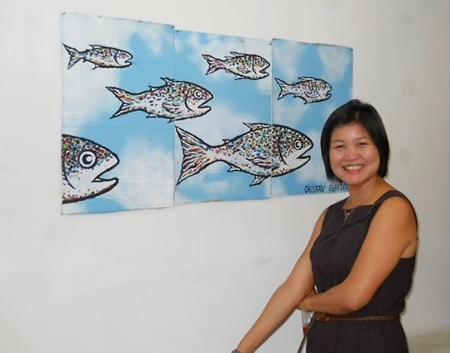 Eng-Ka Gallery is open from 10.00 until 18.00 daily except Monday at 235, Moo 8, Luang Nua, Doi Saket. [email protected] . 053 104 547 or 0899 924 8733.